Early avalanche beacons transmitted at 2.275 kHz (kilohertz). In 1986 the international standard of 457 kHz was adopted. The Ortovox F2 (which was released in 1980) transmitted and received on both 2.275 and 457 kHz. This allowed the F2 to locate both new and old-style beacons. That was handy in the 1980s, but is no longer beneficial. An update to the standard in 1997 specified that beacons must transmit within ±100 Hz of 457 kHz. In 2001 the allowable variance was tightened to ±80 Hz. Unfortunately, older analog beacons that used ceramic oscillators (e.g., the F1 and F2, but not the M2) can drift outside this ±80 Hz range. Newer beacons use crystal oscillators and transmit very close to 457 kHz (typically within ±30 Hz). The frequency drift usually gets worse as the temperature decreases. For example, a warm beacon inside your jacket may transmit near 457 kHz, but when it cools it may drift outside the ±80 Hz range. The Pieps TX600 is a special transmitter that is intended to be attached to dogs or equipment. It transmits at 456 kHz (i.e., 1 kHz lower than avalanche transceivers). 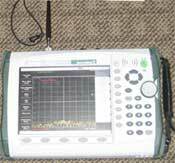 I tested 51 avalanche transceivers (15 different models) using a sophisticated spectrum analyzer to see if they transmitted within specifications. I measured the frequency at 21°C (70°F) and -18°C (0°F) to see how temperature affected the transmitting frequency. I presented the results of this testing at the International Technical Rescue Symposium (ITRS) in 2007. Suffice it to say that 49 of the 51 beacons were within range. The others were only slightly out of range (-90 Hz and -100 Hz, and only when cooled to -18°C). You can view this plot of an Ortovox M2 that is transmitting 63 Hz below 457 kHz. During the testing, I also compared the results of the spectrum analyzer with the built-in frequency tester found in the original Pieps DSP. The downsides of a beacon transmitting outside the ±80 Hz range are twofold. Most importantly, a searching transceiver may not receive the wayward beacon's signal at all. Secondly, the range (i.e., distance) where the wayward beacon can be received will be significantly reduced. This was first brought to my attention by a friend who successfully located three buried Ortovox F2s during a beacon drill in the morning. That evening he went outside to retrieve the beacons and he couldn't receive a signal from any of the beacons. They were eventually located with a different beacon. I suspect the F2s drifted off-frequency as they cooled and that his digital transceiver was being too particular about the required frequency (his model of receiver has since been updated to better handle off-frequency transmitters). I also tested the distance where four different beacons could receive a signal from an Ortovox F2 that was transmitting +200 Hz above the normal 457 kHz frequency (i.e., at 457.2 kHz). The results are shown in the following graph. The maroon bars show the distance that the beacon could receive a properly transmitting 457 kHz signal when the transceiver was held perpendicularly (i.e., in worst-case orientation). The blue bars show the distance that the beacon could receive the wayward 457.200 kHz signal. Note that I only did these tests on one occasion using these four transceivers. The results should be viewed as indicative of the problem rather than as definitive data. You can see that the Pieps DSP which could receive a 457 kHz signal at 48 meters did not receive the wayward signal until 20 meters. The Barryvox 3000 received the signal at 11 meters, but only in analog mode (i.e., the direction indicator did not appear). The Tracker DTS had the smallest percent decrease in performance (although the actual distance was less than the DSP), but the distance of 12 meters is also unacceptable. Needless to say, having an transceiver that transmits this far out of range is dangerous. The original (yellow) Pieps DSP and DSP Tour have a feature wherein they do not normally search outside of the ±80 Hz range when in search mode, but if you press the scan button (labeled either "?" or "(((") they will scan ±500 Hz for several seconds. If it finds a beacon, it will lock onto it while flashing "500" in the display. This feature made sense when there were a lot of old analog transceivers in use, but I doubt many of us would think to toggle this mode if our initial signal search failed. Pieps removed this feature from the DSP Sport and DSP Pro. If you do encounter a transceiver that is transmitting outside the ±80 Hz, I'd be very interesting in having it for my testing (and I may be able to get you a discounted replacement). The Pieps DSP Pro (and the yellow Pieps DSP beginning with version 3.1 software) can measure the frequency of other beacons (the one-button Pieps Tour and Sport do not have this feature). The Pieps DSP Sport and Pro can also test another transceiver (read the details). The photograph to the right shows the DSP Pro measuring the frequency of an Ortovox Zoom+. 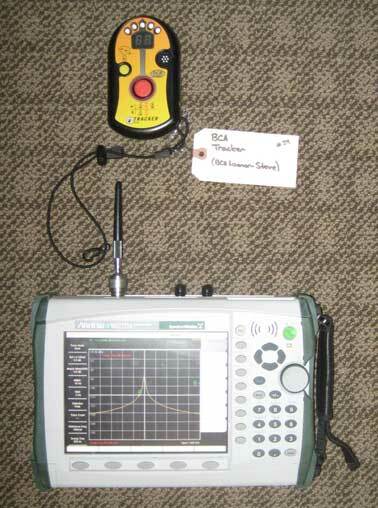 At BeaconReviews.com, we performed more than 100 tests on 51 different beacons at various temperatures and compared the results using a $20,000 spectrum analyzer—the DSP's frequency tester did an excellent job. Switch the DSP into Search mode. Place the two transceivers close together and motionless. Press-and-hold the Scan button just below the screen until "Hz" (or "F" for on the original DSPs) appears in the display. The DSP will then display the amount that the transmitting beacon is off. 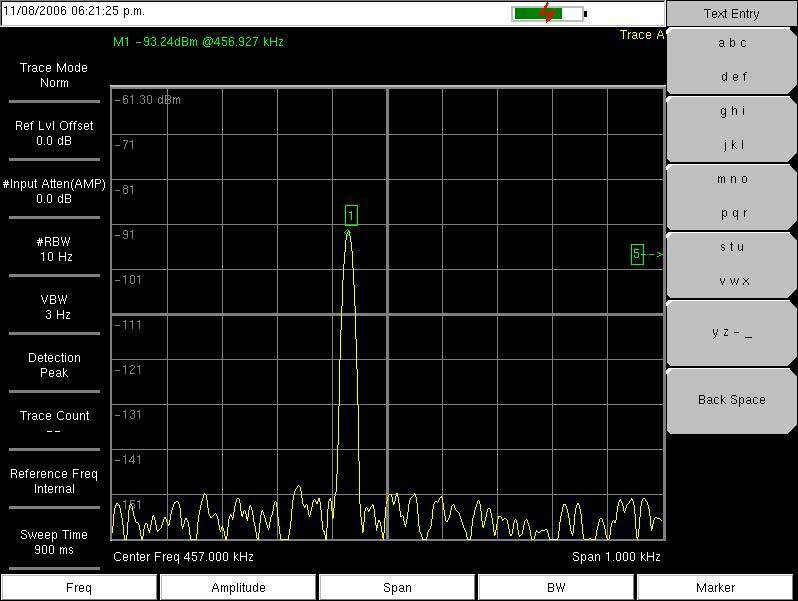 For example, if the screen displays "20Hz" (or "F020" on the original DSP) and the arrow points to the left, it means the transmitting beacon is transmitting 20 Hz below the standard 457,000 Hz, or at 456,980 Hz. In the illustration to the right you can see that this Zoom+ is transmitting at exactly 457,000 Hz. As long as the number displayed is equal-to-or-less-than 80, the beacon is within specifications. The Pieps DSP Sport and Pro have a function that tests the frequency, duration, and periodicity of another beacon. Learn more here. Bruce Edgerly & John Hereford of Backcountry Access, Inc. (the company that makes the Trackers) wrote a good article on this topic. Somewhat related to frequency drift, a "continuous carrier" signal can confuse digital transceivers. Read about it here.